Winter Coziness and Home Tips. 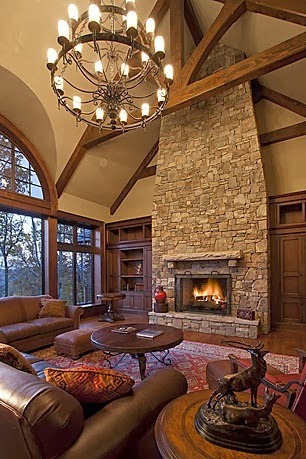 Check out Zillows cozy cabins and rustic fireplace designs they look all so heavenly! And with all this coziness I just have to add a “Did you know”? Of about the 350 million cans of chicken noodle soup of all commercial brands sold annually in the United States, 60 percent is purchased during the cold and flu season. January is the top-selling month of the year! Today January 10th is National Cut your Energy Costs Day. Here are a few energy tips and Winter Home Maintenance Tips for this Winter. Do these first and then enjoy a cozy fire! and reminders of chores you may have overlooked for preparation this winter season. • Clean faucet aerators and showerheads. • Clean refrigerator drain pan and vacuum condenser coil. • Clean kitchen exhaust fan filters. • Vacuum bathroom vent fan covers. • Clean dishwasher food filters and check that openings in spray arms are clear. • Examine caulk and grout in shower, repair as needed. • Clean and seal grout. • Exercise (turn on and off) plumbing shutoff valves. Just in case you may need to in an emergency. • Test relief valve on water heater. • Vacuum smoke detectors, heating registers, vents, ducts and radiators. • Clean out dryer vent duct. These will save energy and ensure a safe home!